How do I add envelope liners to my order and what sizes do you offer? Our envelope liners are printed on 100% post-consumer recycled 80lb text weight paper and are a great way to add additional pop to your wedding suite. 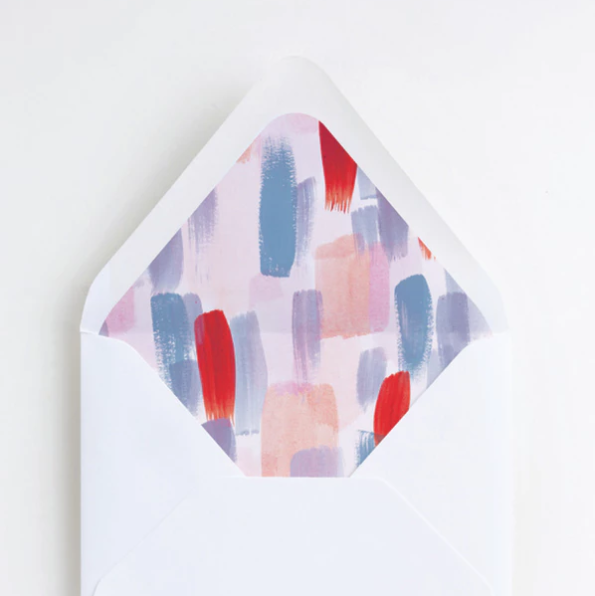 You can find our selection of wedding envelope liners here and they can be added to your cart just like any other item. Each suite has its own matching liner, but you may choose any design you like. Just choose the color or variation you like and add it to your cart in the quantity you choose. At this time, liners come unassembled and they are designed to cover the open flap of the envelope. Liners are considered their own stand-alone add-on item and are not discounted by our site discount. Liners are sold separately from our envelopes and must be added to the shopping cart prior to placing the order. They cannot be added to the order after the order is placed.